The Philadelphia 76ers haven’t been to the playoffs since the strike-shortened 2011-12 season and haven’t really been competitive since getting to the NBA Finals in 2000-01. But now, The Process is starting pay off, the 76ers are one of the most exciting young teams in the league, and secondary market prices for 76ers tickets are trending up. In fact, according to data collected by TicketIQ.com, there are at least five games in 2018 that will cost fans an average of $200 or more to see. As of Dec. 18, the most expensive asking price for an upcoming game is the April 6 game against the Cleveland Cavaliers, who won an NBA title in 2105-16 and lost in the Finals to Golden State last season. The current asking price for a ticket to that game is $289. Games against the Dallas Mavericks, New York Knicks, San Antonio Spurs and Milwaukee Bucks are the four next most expensive in 2018. The Mavericks game has a current asking price of $225 on the secondary market, but fans get into the arena for as little ast $21. The next most expensive ticket is for a game against one of the Sixers biggest rivals, the Knicks. New York is currently on a four-game win streak and tickets for the March 28 game weigh in at $218. Center Kristaps Porzingis is one of the most exciting big men in the game and is in the Top 5 in shots blocked. 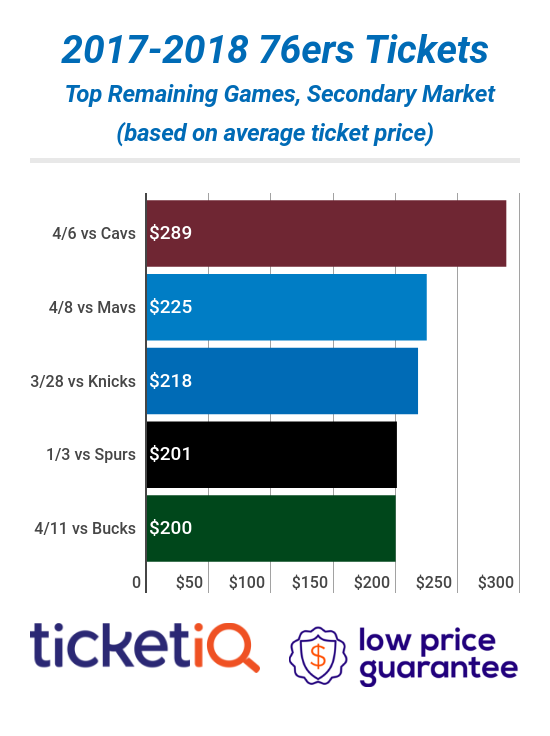 The final two games that currently have asking prices at $200 or more are the Jan. 3 tilt against the Spurs (third in the Western Conference) and the April 11 matchup against Milwaukee, which features Giannis Antetokounmpo, the league's second-leading scorer. Those games will run fans $201 and $200, respectively. Whether you want to see one of the better teams in the league roll through town or you’re a die-hard Sixers fan, TicketIQ.com can help you get in. For the April 6 game against Cleveland, tickets in TicketIQ.com’s Low Price Guarantee listings range in price from $106 in Section 219A up high behind the basket to $448 for a seat 23 rows up at center court in Section 101.